Happy New Years friends!! This is the third year that I have ever joined in on the "pick a word for the year train". I am honestly not sure why I didn't do this years ago because it is such a lovely and sweet idea. Last year as I prayed about a word for the year 2015 (and chose the word "Mettle") it really allowed me time to focus, think and pray about the coming year. It was the same in 2014, when I chose the word "Valor". (3) In a new or different, typically more positive way. Granted, it is not a word that is "common" or used everyday but the definitions sum up exactly what I pray for for this coming year. This battle for my health continues to be very difficult and demanding and I want to meet this challenge with the hope of what is coming. I want to persevere and yet live fully in this season. As I lean on the Lord's strength to conquer the "unknowns" of what lies ahead with my health, healing, relationships, my professional life, my shop, my writing, and some personal circumstances I can rest fully in the knowledge that His strength is going to give me the joy to face these demanding and difficult situations. Finally, I want to be a good soldier for the Lord in this difficult situation and have the quality of temperament to face the pain of illness, the strength to believe in the impossible, and the lovely peace that comes from trusting a Sovereign God fully without fear. A lot of time as a young sick gal I find myself facing the truth that I struggle with this season being one of "crumbling". To be honest, it is not a lot of fun. *smiles* The other day I was moaning and complaining to the Lord and saying, "hasn't there been enough pain?" "hasn't there been enough sickness?" "haven't I endured enough on this journey?" And the Lord quietly replied, "My child, I love you. When you pass through the waters I will be with you; and through the rivers, they shall not overflow you; when you walk through the fire, you shall not be burned, neither shall the flame scorch you." (Isaiah 43:1) I am humbled by the Lord's love that so graciously puts up with my complaining. How great His love is for His children. BUT... I admit that I have been dealing with some deep grief behind the scenes. Recently I have felt such a tug-of-war about wishing this story was different. I have cried many tears about the deep aching dreams that I see others receiving and living while I struggle to get out of bed some days. My "successes" of the day often revolve around things that would seem small to the rest of the world. I haven't talked about it much on this blog but it has been a death ... a relinquishing of many many dreams on this long journey. There have been many tears that have been spent on this tender subject. Many tears wondering if my greatest dreams of being married and being a mama will come true. Even writing those words and reading them is difficult as I surrender to the Lord. If you are weary from grief or from whatever the season of last year held (or even for what the beginning of this year has held so far!) I pray, that you will join me in looking at this coming year "anew". Let us live, as Blythe said, "seeking grace to understand how God is pursuing and healing our hurting hearts". The Lord is starting something beautiful anew. Great word and great meaning behind it! I don't know too much about the heath issues that you're dealing with right now, but a quick glance at your "About Me" blurb says Lyme's Disease and Cancer. I watched my mom go through both (separately), the Lyme's Disease most recently and it's a hard journey. My prayer for her was always for peace, healing and that she (and our family) would be a light to the people she encountered and an example of God's love and grace. I pray that for you too. Crystal, I am so sorry to hear of your mom's health struggles. Lyme Disease is such an incredibly hard and long journey and I wouldn't wish anyone to have to suffer with it. Thank you for your encouragement and for your prayers. Your mom will be in my prayers as she continues to fight for her health. What a great word to embody in 2016. I hope you have a lovely 2016. Thank you so much for stopping by Jenny and for taking the time to comment! I hope you have a lovely 2016 as well! I was excited to check out your blog and connect with you a little more as I see we are both apart of BBP! 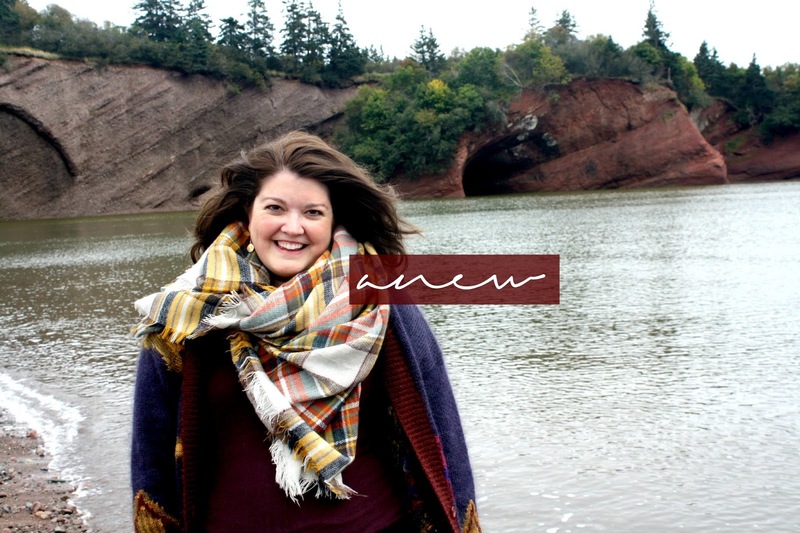 Excited to be your newest follower via bloglovin! Love that word - I love how the Lord will bring something to mind when we ask! That is how I picked my word for the year too - I couldn't decide, and then the Lord just brought a verse to mind. Thank you so much for stopping by and reading and leaving a comment! Thank you so much for the encouragement too!! I love how the Lord brings specific words and verses to mind as we pray and seek His direction!! Did you write about your word for the year? This weekend is my blog reading catch up time and would love to read yours if you posted about it or if you would like to share? :) I hope that 2016 is starting off wonderful for you with your precious little new addition! I love all the verses you have in here...so beautiful, and such a sweet reminder that God is always doing something new in us. I love further on in Isaiah 43 how God reminds us that He is doing a new thing in us and that new thing is springing forth, even as we don't perceive it. I am excited to see what God will do in you and through you this year, Rebecca!